There's a reason the handmade Kilty moc is Minnetonka's most popular style. Durable, high-quality leather is just the beginning. 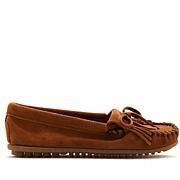 There's also the sporty, flexible sole; handstitching and rawhide laces to complete the Minnetonka look. Treat yourself to this amped version of the Kilty and love the way you shine. As per usual, great Minnetonka quality. I got these for my sister as a Christmas gift. She will love them. Minnetonkas do run a little big. I have been looking for silver flats and these fit the bill. 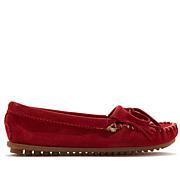 These shoes are very nice and look great with jeans. Unfortunately, I followed the recommendations in some of the reviews to go down a size and they were a bit snug with bare feet so they would never work with even thin socks. I sent them back and ordered my regular size. I would rather have then a bit big than snug. I really like these and they're nice quality. I had to return them for a smaller size. They were to wide and too long. These are so pretty. Metallic silver. Probably comfortable. I tried them on, and walked in my living room. I usually wear a size 8. Ive never bought from this brand before. I heard these were narrow. Oddly enough size 8 in this brand is too big! Has my feet shrunk? Idk. Lol. Thought about exchanging for a 7.5 but I'm hesitant. I'll return these until I know for sure what size I wear in this brand.